Want to schedule automatic payments? Click here. “Quantity” is the number of months you would like the service. 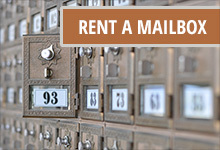 Note: “Names” refers to the number of individuals and or business names receiving mail at a mailbox. If you have any questions regarding how many recipients are on file to receive mail at your box please call (310) 450-4479 or email info@smmailboxes.com.